In a rare and intimate one-night event, apparel/book/font designer, publisher, and manufacturer of design objects, Andy Cruz of House Industries will speak about his work and House’s most recent collaboration with the estate of Charles and Ray Eames. As a partner in the cutting edge design phenomenon House Industries, Andy has helped steer the course of visual culture over the past fifteen years, creating design work with toes dipped liberally in fine art, Modern design, vernacular commercial art, and brand-oriented graphic design. See the past and the future collide and how the aesthetic of tomorrow will emerge! Includes presentation, light buffet dinner, drink, limited edition publication and limited edition print. Email info@nonaca.net before Friday, Sept 10. 6pm. Two new publications out now. First, a new feature for the latest issue of Idea Magazine (issue #340) called Forms of Practice, interviewing young designers, is on newsstands now. Second, the foreword for a new book from Sandu Media called Mini Graphics, an exploration of small-scale graphic design projects. Brand new Cooper revival out as of 5 minutes ago! Cooper Hilite Complete is a complementary set of two fonts- Cooper Black and Cooper Hilite. Either typeface can be used alone, or as a stackable, multi-colored set. Cooper Black, the most famous and successful of Oswald Cooper’s type designs was released in 1920, following a year of development fleshing out the weight of the typeface and filling out the full character set. Cooper redrew the lowercase characters multiple times, toying with the rounded forms of the “m” and “n” and engaged in a lively debate with McArthur over the final form as McArthur requested that the typeface be drawn bolder and bolder. Cooper famously said the face was “for far-sighted printers with near-sighted customers”, and the public agreed. Sales of Cooper Black were voluminous, and Barnhart Brothers and Spindler had a difficult time keeping up with the demand for the typeface. Conservative typographers were critical of Cooper Black, though it was overwhelmingly popular, helping to shape the American advertising landscape through the 1920s and 1930s. 1925 saw the release of Cooper Hilite, the highlighted companion to Cooper Black. The design was executed by merely painting white incised negative spaces on a proof of Cooper Black. These two typefaces are the result of researching Cooper’s original drawings and series of engraved proofs for both typefaces. The typefaces include the full range of punctuation and diacritics that fill out a full character set. The typefaces have been lovingly kerned for the smoothest result in text setting. Jonathan Ive, Apple’s senior designer (iPod, iPad, iTouch, et al) likes the YACHT logo so much that he and the Apple design team dropped some free custom laser-engraved iPods on the YACHT team last week. I wrote a 10,000 word essay called “Heft, Gravy, and Swing: The Life and Times of Oswald Cooper” for the latest issue of Idea. The essay serves as the definitive biography of the Chicago type and lettering designer, famed for his Cooper Black typeface. The essay is the result of a long-dreamed of trip to Chicago to sift through Cooper’s original drawings, scarce writings, and working papers. Copiously illustrated with proofs of Cooper’s work, unpublished typefaces, and photographs of rare design work, his legacy is brought into contemporary focus. New biographical information about Cooper, his work, and his associates is discussed within. Bertsch & Cooper was a visionary commercial art service. They were one of the first shops in Chicago that offered to create layouts, compose artwork, and typeset text all under one roof. They continually added staff, resulting in a scattershot assortment of illustrators, draftsmen, and compositors peppered throughout the same building in a variety of rooms. At their first location, Bertsch was famous for his “inter-office communication system” which consisted of yelling upstairs and down from the inner balcony of the building to professional associates. Cooper was ensconced in the “bull pen”- a room with a half dozen or so other commercial artists scratching away at the jobs of the day. Cooper was renowned for his “filing system”- a towering, dusty, haphazardly curved pile of layouts, proofs, notes, and other assorted papers that loomed over his desk, each day’s ephemera separated by a newspaper from that date. This pile grew in relation with Bertsch & Cooper’s increasing roster of clients, which included a number of local Chicago businesses including doctors’ offices, legal firms, coffee shops, and banks, New York’s Marchbanks Press, the department store Marshall Fields, Strathmore Papers, Red Book Magazine, American Printer Magazine, and the American Institute of Graphic Arts. Cooper’s distinctive lettering can be found on a series of public service announcements for the United States government’s Food Administration, exhorting the public to eat less and conserve rations during World War One. The article was jointly designed by myself and the Shirai Design Office, the esteemed designers of Idea. It contains the first public showing of Cooper Italic Complete. Oh, and it’s in both English and Japanese. I’ll be exhibiting a number of illustrations drawn for the recent Blunt Mechanic CD on Barsuk Records on February 13th at the Sakura Gallery in Nakameguro. 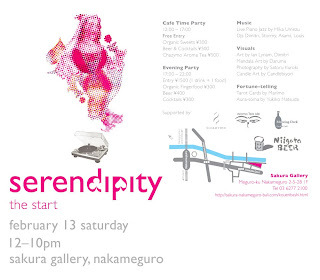 The exhibition is an all-day art party and exhibition, running from noon until 10pm. Supported by Niigata Beer, Chazymo, Aroma Tea Ale, and Mooring Deck. My latest print project, a double poster set called “Poster Initiative 004A” will debut at Grasshut in Portland, Oregon in the show “Staying Put”. The show opens tomorrow, February 6. The show is a collection of prints from folks such as Yellena James, Tim Biskup, Scrappers, Chris Johanson, APAK, Mauro Gatti, Shawn Wolfe, The Little Friends of Printmaking, Studio Folk, and others. Work from the show is available online here. Just released via MyFonts, my latest typeface release is the definitive version of Oswald Bruce Cooper’s great lost typeface Cooper Fullface Italic. At the end of 1927, Oswald Bruce Cooper yearned to create a heavy “modern” face- akin to Broadway and other display types in height and proportion, but more nuanced while being a dense, black type. The Barnhart Brothers & Spindler foundry, for whom Cooper had designed a number of typefaces, saw the potential of the typeface as a big seller. Richard McArther, General Manager of the foundry, referred to it as “the hotsy stuff”, though he was highly critical of a number of characters in the original design. He requested a successive number of modifications, including the addition of Dwiggins-inspired serifs to the face to make it stand apart from similarly-weighted typefaces then on the market. He wanted to imbue the face with a considerable amount of “old-timey” flavor in order to impart a sense of originality to the face and have it sell across both Modern and Bodoni/Didot market segments. The resulting typeface was called Cooper Fullface, a jaunty and swollen caricature of a Didone with great potential for display advertising work. The final form of the face was a regulated and consistent balance of cartoonishness and earnest visual braggadocio, the bouncy, circus fairway-like swing of the original drawings of the letters taken down considerably and figures redrawn and redrawn for maximum readability. A specimen sheet was mailed out in 1929, and generated moderate sales, but too late- Barnhart Brothers & Spindler closed its foundry division shortly thereafter as part of ATF’s corporate roll-up of manufacturing. The American Type Founders continued to produce the face and sell it at a decent pace, renaming it Cooper Modern. Cooper designed a matching italic for Cooper Fullface, but it was never released. The BB&S foundry closure resulted in the foundry equipment being shipped to New Jersey a few weeks shy of the typeface’s completion. It is unfortunate, as the accompanying italic is perhaps Cooper’s masterpiece, a lively Bodoni-esque italic with more than a bit of influence from 19th Century display types, particularly in the treatment of the ball serifs on the uppercase “A”, “J”, “M”, and “N”. Cooper Fullface Italic stands as the until-now missing bookend to Cooper’s career as a type designer. This digital release is the revival of that lost Cooper typeface, Cooper Fullface Italic. Within are two typefaces- Cooper Fullface Italic and Cooper Fullface Italic Fancy. The two faces span the range of Cooper’s original drawings- the Fancy typeface utilizing a number of alternate characters. These two typefaces are the result of researching Cooper’s original drawings and series of engraved proofs for both typefaces. The typefaces include the original ligatures, original Oz Cooper ornaments, fancy swash characters, and a range of punctuation and diacritics, et al, that fill out a full character set. The typefaces have been lovingly kerned for the smoothest result in text setting.